This seven-CD box set may not be what you'd expect from musician-composer Yuval Ron, who is perhaps best know for his Yuval Ron Ensemble, which focuses on peace issues and interfaith dialogue though Middle-Eastern music flavors. And his musical political comedy West Bank Story. 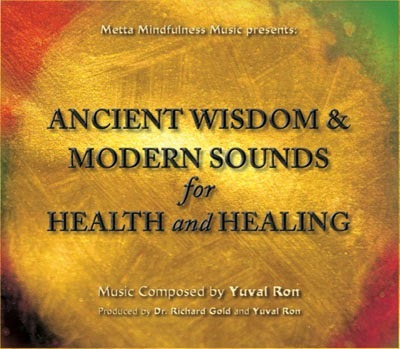 Here he turns his sights toward meditational healing sounds, or perhaps soundscapes, with each CD providing a single 45-minute track to which you might mediate, receive a massage, or do whatever it is that people who aren't listening to raucous Balkan brass bands (like, yes, me) generally do. Each CD has its own flavor supplied by different instrumentation: bass, oud, and didgeridoo on "Earth"; Guzheng harp on "Water" ; bamboo flute on "Fire"; all accompanied by Ron's keyboards and electronics. And breathing sounds by co-Producer Richard Gold. In the interests of everyone's safety, I'll repeat a note found in the CD's booklet: "This product is not intended to diagnose, treat, cure, or prevent any disease. See your physician if you seek diagnosis or treatment. It may be hazardous to operate heavy equipment or drive while listening to this music."